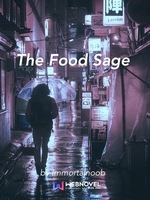 The wonderous adventures of the Food Sage as he finds his way to the top and revolutionizes the way food can be interpreted. Happy I tried this out. I was on the fence about this, but took a chance. The writing is easy to read and like it so far. Hope for daily updates. Thanks author! On the rugged, barren landscapes. There appeared a white-robed man that walked so slow that even a snail can beat him, and yet he moved so fast, appearing as if he was teleporting with every step. This man walked across the entire island and met a plethora of different animals and plants that never got to see the light of day again; however, while he was strolling through the lands, he found an extremely deep valley. This valley seemed to pierce right into the center of the earth, exuding a darkness so great that even the universe found it detestable. Shrouding the darkness like a veil, the light covers all of the possible exits that the darkness can escape from. "Okay kid, I think that's enough storytelling for today", said a middle-aged man, dressed in a luxurious outfit, adorned with a symbol of a golden angel riding a black dragon on his chest. "Grandpa Lin, can you please continue on with your story? I can make you some of my special lemon ramens with chicken if you do", said a kid dressed in flip-flops, grey sweatpants, and a grey T-shirt with a yin-and-yang symbol embroidered on the back. Furious, Lin whacks the kid on the head and says, "Grandpa your head! I am not that old, now go back and fix that outgoing attitude of yours. Nobody in this world dares to call me old, unless they want a grave-less death", while simultaneously grabbing a bottle of an unknown substance from his spatial pouch and smuggles it into the boys' pocket while he's distracted. Confused, the boy asks, " but grandpa...if you aren't that, then what are you? ", afterward, he runs off with a smirk on his face. "You little brat, I'm not that old", Lin murmurs. Afterward, he takes out his phone and calls someone, "Hello it's me, is the spy captured yet?". The kid's name is Jacob Michael Cardona and he comes from a middle-waged household, they can't buy the latest technology and have to make do with older patented technology for most of their needs but fortunately, they make-do. Due to the technological advances in society, the masses started to have a mind of their own and revolted in the year 2587, also known as "The Great Revolt of Humanity". Due to these uprisings around the world, every major state issued severe warnings towards them and created patrol forces designated- with the sole purpose of eliminating them. In the year 2675, the revolt had gotten worse and crime rates skyrocketed. Furthermore, the discovery of new technology leads to a discussion of the mass about the appearance of extraterrestrials in the cosmos. In the year 2746, the entire social monarchy collapsed, and an epidemic occurred, in which, shook the whole human species underfoot, " The Change." This epidemic was caused by the sudden shift of the tectonic plates, leading to the reformation of every continent, creating Pangaea. The following year, the rules of heaven and earth changed, in which a new substance called "Qi" appeared and the term "cultivation" appeared alongside it. Qi appeared in the form of an invisible gas, alongside oxygen, nitrogen, argon, carbon dioxide and the other gases; however, the density of Qi appeared 100 times heavier than any other type gas on planet earth. The change brought about many benefits for humanity, allowing humans to live up to 200 years old. Unfortunately, benefits don't come without a cost. The next 20 years was the calm before the storm, also known as, "The Reconstruction Era." The countries of old disbanded and the era of sects emerged; racism ended, and power became the ruling cause of everything. Each sect had a title that matched or had a similarity towards the profession that it offers; however, there were some irregularities among them. The sects that had the most prestige were the 5 great establishments, having just formed: The Floating Cloud Sect, The Blacksmith Alliance, The voyager Guild, The Dark Guild, and The Sage Sect. The Floating Cloud Sect majors in the study of space and it's related subjects, The Blacksmith guild teaches the subject of metals and how to use them alongside their applications. The Voyager Guild is similar to The Floating Cloud Sect because of their study of the beyond; however, the Voyager Guild also trains explorers to trek the beyond. The Dark Guild is an anomaly among them because it's actually a fighting guild, known to train combatants in the art of defense or killing. Lastly, The Sage Sect and although it's called a sect, it's actually a school. This sect has the highest battle prowess and knowledge among any other sect, ranking number one among the five great sects at the time. Every newcomer in the Sect is known as a student, people with 50% mastery of the subject that they major in, are known as teachers, someone with 80% mastery is known as an elder, and people with 100% mastery are known as Grandmasters in the field, but if someone goes beyond the method of learning and starts creating, they are known as sages and have the highest honor in the world, claiming the title, "Explorer of Mankind". Unfortunately, the peace didn't last before 4 dark red meteorites crashed simultaneously into the vast ocean on the year 2768, on July 23rd. The Floating Cloud Sect sent 10 astronomers and 4 meteorologists to each last known recorded location via armored-jet-helicopter. Every helicopter vanished when they went within 1 mile of their respective meteorite and unfortunately before the Sect could find out any additional data on the meteorites, the meteorites started to change the entire ocean a light red color. The entire ocean was dyed a blood red after 5 hours, and before all of the organizations could get ahold of this information, every creature that was within the blood red water turned vantablack with the same color eyes like the sea. This did not include humans because any human that touched the water started to burn from the place of contact towards the rest of their body until they fully turned to dust.